US Treasury announces it will sanction Iran's Revolutionary Guards after President Trump decertifies Iran's compliance with nuclear deal. 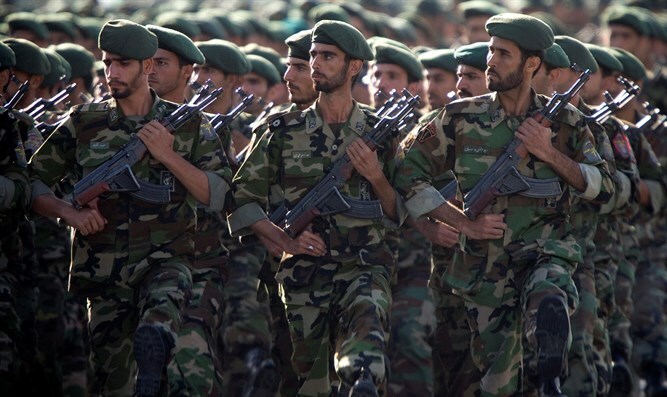 The United States Treasury announced that it will slap sanctions on Iran's Islamic Revolutionary Guard Corps (IRGC), an elite unit considered close to Supreme Leader Ayatollah Ali Khamenei, in addition to sanctioning four organizations it says supports Iran's military. The move came after Trump officially decertified Iran's compliance with the 2015 nuclear deal and vowed to implement “tough sanctions” on the Revolutionary Guard Corps. Trump vowed to end Iran's support for terrorism around the world, calling the sanctions "long overdue". "It has hijacked large portions of Iran's economy and seized massive religious endowments to fund war and terror abroad. I am authorizing the Treasury Department to further sanction the entire Islamic Revolutionary Guard Corps for its support for terrorism and to apply sanctions to its officials, agents and affiliates," said Trump. "I urge our allies to join us in taking strong actions to curb Iran's continued dangerous and destabilizing behavior, including sanctions outside the Iran deal that target the regime's ballistic missile program in support for terrorism and all of its destructive activities, of which there are many," Trump continued. Treasury Secretary Steve Mnuchin called on businesses not to deal with the Islamic Republic, saying that "we urge the private sector to recognize that the IRGC permeates much of the Iranian economy, and those who transact with IRGC-controlled companies do so at great risk". The White House said later that “It is hard to find a conflict or a suffering people in the Middle East that the IRGC’s tentacles do not touch". The IRGC responded in a statement on Friday by calling itself "the most effective corps in the region,” and saying that if not for the IRGC, "terrorism would have overwhelmed many countries in the region".